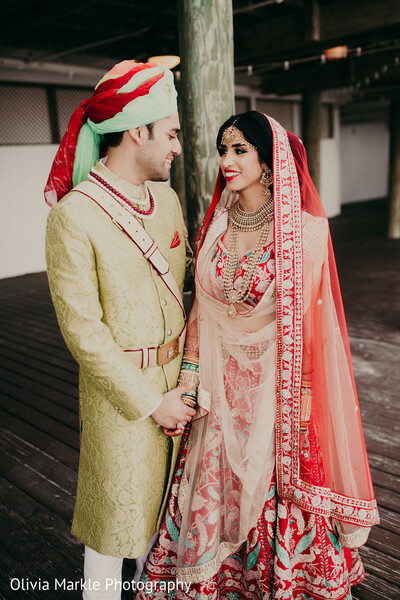 The glitz and glamour at Nupur and Digvy’s beachside Indian wedding soiree had us mesmerized. 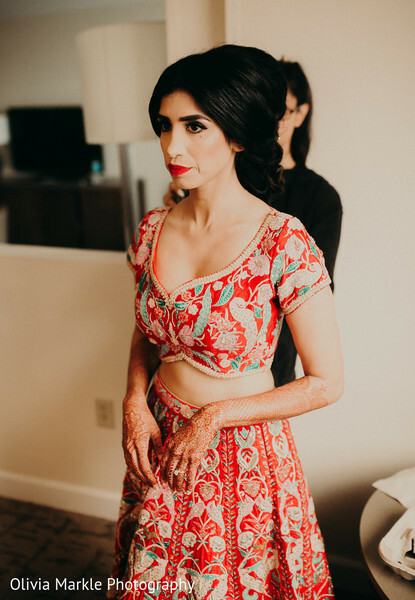 These two are a stunning duo, and it was a treat to watch them carefully ready themselves for the most important day of their lives. 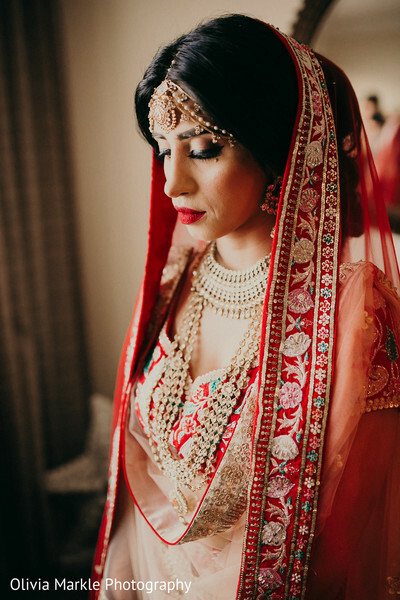 Nupur’s intricate red bridal wear featured delicate white and turquoise embroidery, and she accessorized with layers of sparkling jewelry. 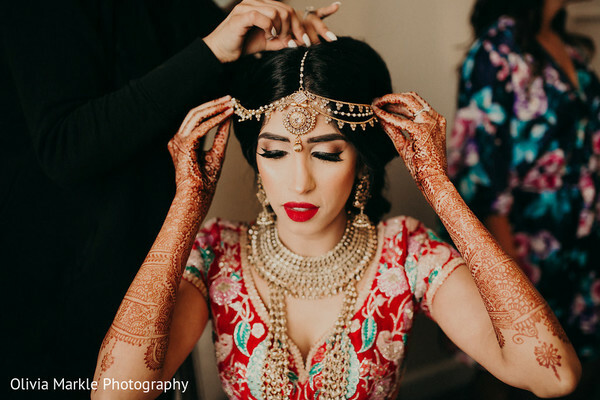 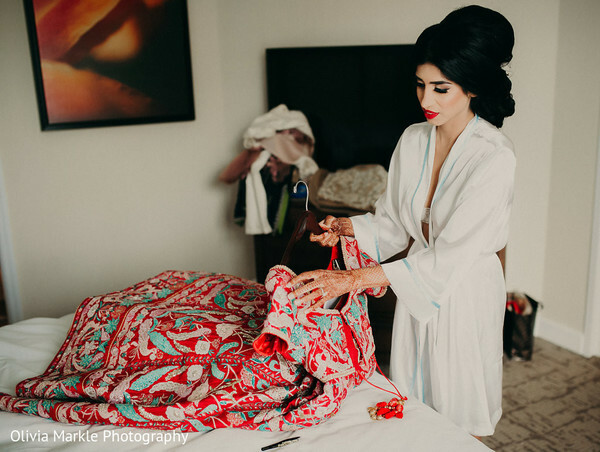 She was festooned with Sana Rehman’s beauty brushes, and her shimmering eyelids, ruby red lips, and bouffant ‘do had us giddy! 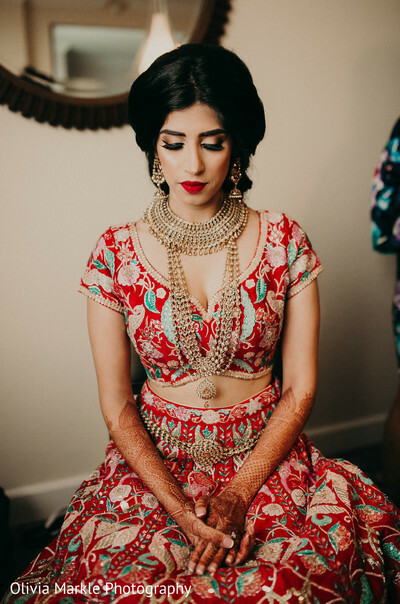 Her lovely bridesmaids couldn’t hide their delight as they caught a first glimpse of this stunning Maharani. 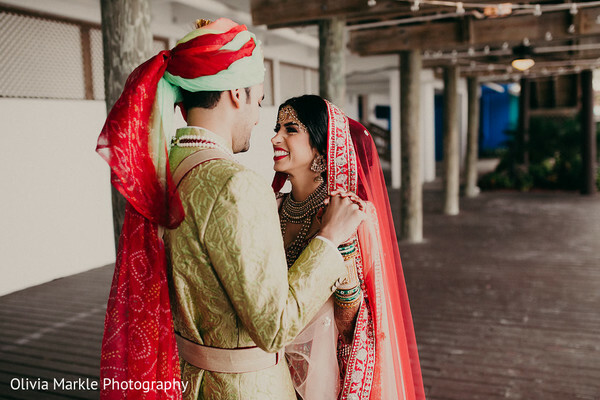 During Nupur and Digvy’s magical first look, the lovebirds frolicked on the pristine white beaches while Olivia Markle Photography captured some lovely shots. 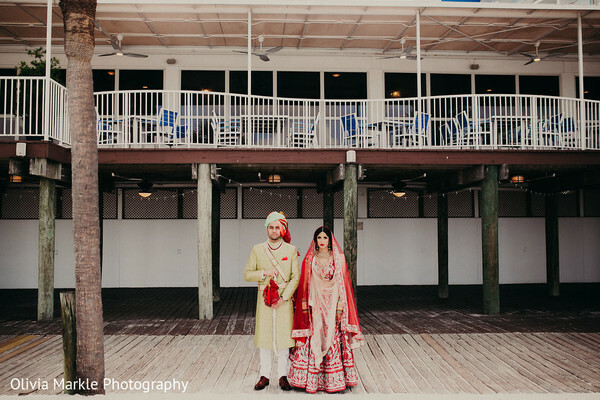 Meanwhile, the artists at Dreams To Reality were busy decking the outdoor grounds of the Hilton Clearwater Beach Resort & Spa with breezy decor, such as a peach, open air mandap, a Ganesha statue, and adorable signage. 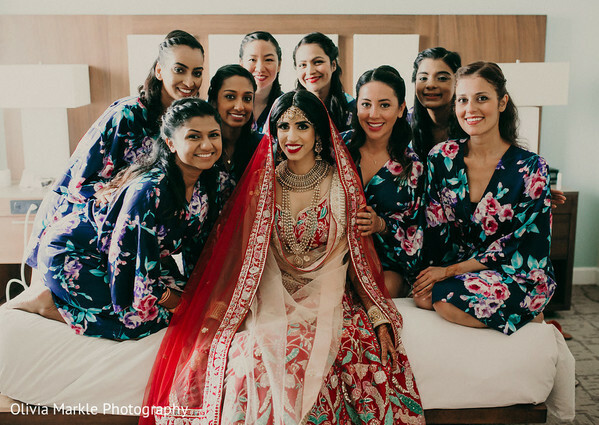 The decor worked perfectly with the bride’s vibrant lehenga and her bridesmaids’ coral saris. 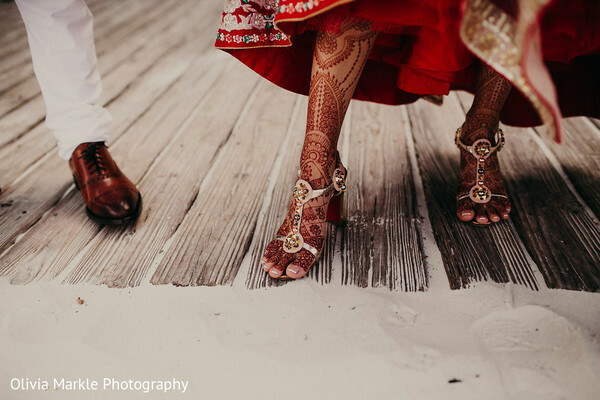 We’ll dive into the ceremony action in our next post. 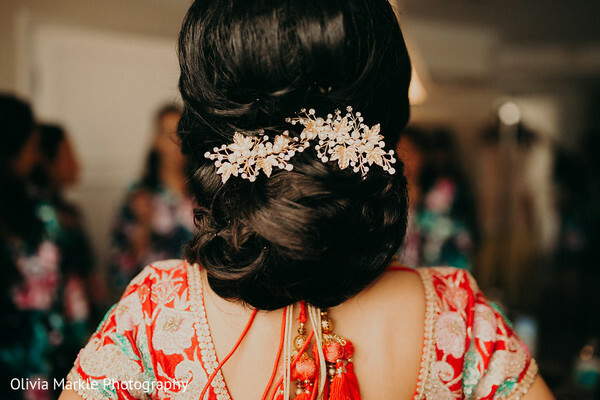 Meanwhile, peruse the full gallery for a stunning collection of photos captured by Olivia Markle Photography. 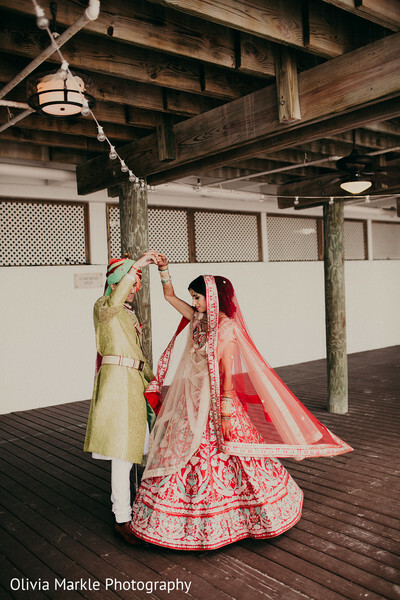 For more from this fab wedding, click here to head to our Platinum Guide page, where we’ve covered Nupur and Digvy’s Haldi and Sangeet events! 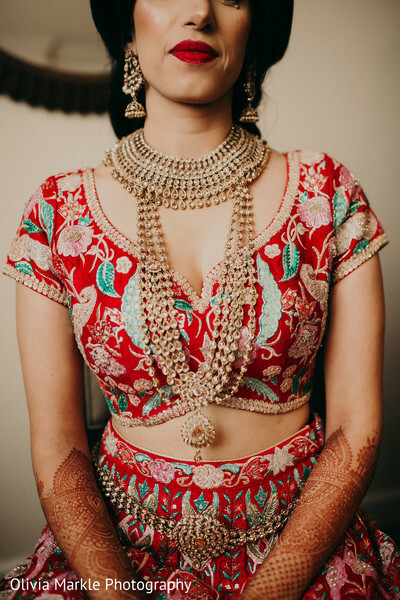 Coming up next is Nupur and Digvy’s ceremony coverage, following by reception fun with DJing by Dhol Beat International!